Dave Appell was a musician, songwriter, arranger and producer and he had a track record in the music business that stretched from the dance band era of the 1940s through to the 1970s. He was born in Philadelphia in 1922 and in his early twenties was working with the big bands of Benny Carter and Jimmie Lunceford. In the early fifties he was leading The Dave Appell Trio then the Dave Appell Four who made some ‘swing’ records but with the advent of rock ‘n’ roll he was persuaded to change the name of the group to The Applejacks. As Dave Appell And His Applejacks he was one of the first signings to the President label and soon wholeheartedly embraced rock ‘n’ roll with releases such as “Teenage Meeting (Gonna Rock It Up Right)” and “The Rock And Roll Story” both in 1956, the year he and his group appeared in the film “Don’t Knock The Rock” alongside Bill Haley and Little Richard. The two songs they performed, “Applejack” and “Country Dance” were also released as a single on President. 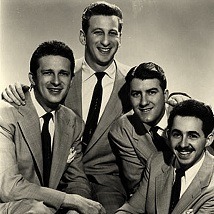 The group was one of the first rock ‘n’ roll acts to be featured in the clubs of Las Vegas, but they were Philadelphians at heart and Dave returned to that city where he joined the Cameo label as an arranger and leader of the house band. There he chalked up three instrumental hits for Cameo, the biggest of which was “Mexican Hat Dance” in 1958. At Cameo he also worked on hits by nearly all the label’s artists from Charlie Gracie, to Chubby Checker, The Orlons, The Dovells and Bobby Rydell. His name also featured strongly in the writing credits for many a Cameo release, his biggest success probably being “Let’s Twist Again”. In 1967 he was East Coast A ‘n’ R Director for 20th Century Fox Records, but it was 1970 before his name graced the columns of Billboard’s Hot 100 again. This time it was as co-producer with The Tokens of Tony Orlando And Dawn both for the Bell / Arista and Elektra labels. Dave Appell died, aged 92, in November 2014.